Hong Kong returned to Chinese sovereignty in 1997, after 156 years as a British colony, though it enjoys status as a Special Administrative Region (SAR), allowing it to have its own independent political system. Hong Kong's SAR status will expire in 2047. Hong Kong International Airport processes one of the highest numbers of people daily and has won awards for efficiency. As a former British property, Hong Kong residents retain some British traditions, such as afternoon tea at 4 or 5 in the afternoon. Many restaurants offer specials during this time. Hong Kong is the most densely populated city in the world, and it has more skyscrapers than anywhere else-around 8,000 total. There are more mobile phones than people in Hong Kong. Many visitors to Hong Kong have stared wide-eyed out their taxi window at Hong Kong's famous night skyline along Victoria Harbour, the deep-sea harbor that first put Hong Kong on the world map as one of the world's major shipping destinations. The harbor is lined with brightly lit buildings, from the distinctive jagged lines of the Bank of China building, to the elegant stateliness of the International Finance Centre Building, to the perfect feng shui of the HSBC headquarters. Every night, an impressive laser and light show is performed at 8 pm, when the skyline's most famous buildings participate in lighting up their exteriors while choreographed to music. The show, called A Symphony of Lights, lasts for ten minutes and includes 44 buildings on both sides of the harbor. Across the waters of the harbor, the iconic Star Ferry plies the waters, carrying commuters from Hong Kong Island to the Kowloon Peninsula. The ferry ride is an attraction in itself, with thousands of tourists riding each day, in addition to the commuters, having been named one of the ten best ferry rides in the world in 2009. Kowloon, along with the north coast of Hong Kong Island, is one of the most densely populated areas on earth, something you can experience while riding the ferry, or trying to cross the road during rush hour in Wan Chai. Yet Hong Kong is more than skyscrapers and neon lights. North of Kowloon in the New Territories, sleepy fishing villages retain a traditional lifestyle, and wind-swept beaches accessible only by foot beckon intrepid hikers. The outlying islands, such as Lantau and Cheung Chau, exhibit a slower pace of life, with subtropical rainforests, nature reserves, and mystical temples as part of their appeal. Street markets filled with curios and trinkets, as well as more valuable jade, silk, and pearls, abound in the alleys of Hong Kong, right alongside enormous air-conditioned shopping malls, as the city brings a little something for everyone seamlessly into its fold. 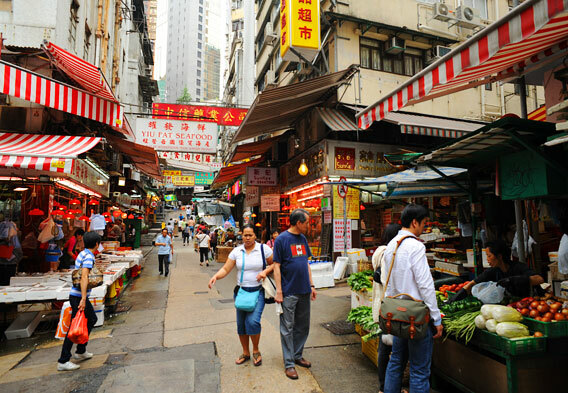 Kowloon has some of the oldest neighborhoods and many prominent tourist areas. Tsim Sha Tsui boasts fancy hotels and restaurants, and is a great spot to watch the evening light show along Victoria Harbour. The harbor crossing between Tsim Sha Tsui and Central on Hong Kong Island is one of the most picturesque in the world. 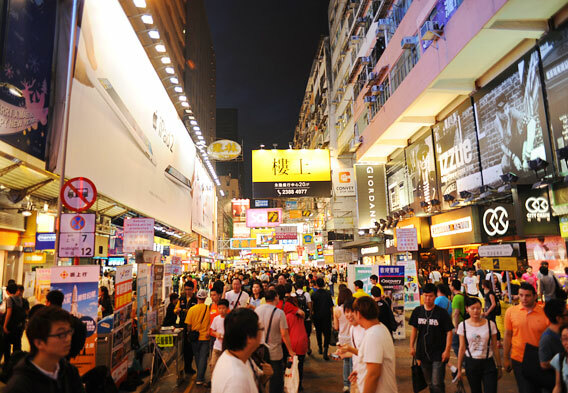 Nathan Road is Kowloon's main thoroughfare and its oldest road, taking you from Tsim Sha Tsui to the markets of Mong Kok. One of Hong Kong's most popular destinations, Victoria Peak offers a panoramic view of Hong Kong Island and Victoria Harbour. 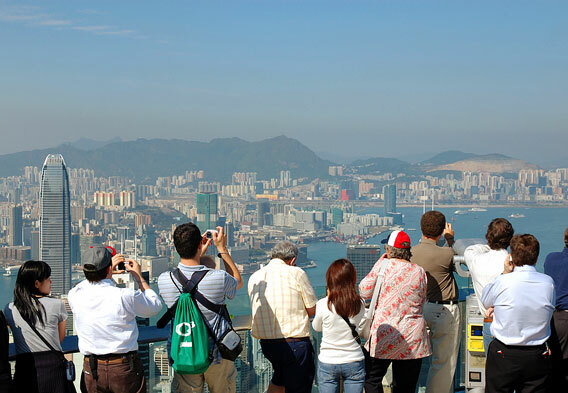 The viewing platform on the top has restaurant facilities and shopping, and you can reach the peak on foot, by Old Peak Road near the botanical gardens; on a public bus or minibus to the Peak's Galleria; or via the Peak Tram, the funicular that leaves from the Central district of Hong Kong. It's best to visit at night to get the full impact of Hong Kong's skyline when it is lit up. Hong Kong has no shortage of shopping malls and by waiving the retail tax for tourists, it is an attractive place to buy many international brands. However, street markets such as Temple Street offer a more local experience, with stalls hawking cheap clothing from mainland China and other trinkets, as well as tiny shops specializing in Chinese medicine. Meanwhile, Central Market (located in the Central district) is one of the city's oldest wet markets, and is a great place to pick up fresh meat and groceries, or to watch the locals doing so.